Although every biopic takes its share of liberties with the facts, Jobs doesn’t wander too far from the historical record in its big-screen retelling of the Apple cofounder’s life. (And as I argue in my review of Jobs, that may be to the movie’s detriment.) Still, we all think of ourselves as the heroes of our own narratives, not the by-product of some screenwriter’s vision of who are. So here’s a brief list of the people and institutions who may have a beef with the big-screen versions of themselves in Jobs. Jef Raskin appears in two scenes in Jobs, the first as the bumbling head of the faltering Macintosh team who gets put in his place by Steve Jobs and the second as he cleans out his desk, having been given the bum’s rush. 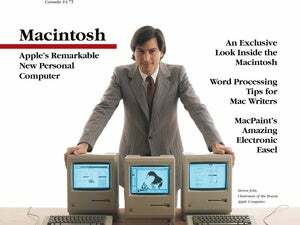 That hardly seems a fair depiction of a man dubbed the Father of the Macintosh—though, admittedly, not everyone agreed with that moniker. What isn’t in dispute is Raskin’s influence on user interfaces, particularly when it came to the Mac’s legendary ease of use. And, as Raskin liked to point out in interviews, he kept the Mac project from being scuttled on multiple occasions when one influential Apple employee—whose name rhymes with “Steve Jobs”—kept arguing for the Mac to be ditched (at least until Jobs was removed from the Lisa team and reassigned to the Mac project). One of these men is interested in a garden of pure ideology; the other is actor J.K. Simmons. The real Rock is a visionary in his own right: In addition to his role as an early Apple backer, he was one of the first venture capitalists to invest in what would become Silicon Valley, and he helped to launch Fairchild Semiconductor and Intel. And if nothing else, Steve Jobs isn’t the only character in Jobs to grace the cover of Time magazine. Veteran character actor Kevin Dunn plays Gil Amelio, Apple’s CEO for 17 undistinguished months from 1996 to 1997, appearing as a flummoxed chief executive clearly in over his head who is promptly outwitted by Jobs for control of Apple. This portrayal is fairly accurate, actually. At least Amelio gets some screen time. Michael Scott—the guy who was Apple’s CEO from 1977 to 1981, and not a lightly regarded middle manager at an East Coast paper company—and Michael Spindler don’t appear in Jobs at all. In fact, they’re the only Apple CEOs to be left out of the movie (other than Tim Cook, who is unlikely to be bothered by that fact). Mike Markkula (Dermot Mulroney) and John Sculley (Matthew Modine) are two Apple CEOs who made the final cut of 'Jobs'. Better luck in the sequel, Michael Scott and Michael Spindler. Apple’s third cofounder along with Jobs and Wozniak, Ron Wayne is the forgotten man of Apple’s history. The makers of Jobs certainly seem to have forgotten him, as Wayne gets nary a mention in the movie, not even a peep about his selling back his stake in Apple to the two Steves 12 days after the company’s founding. Maybe the filmmakers didn’t want to bum everyone out. It’s a man’s world in Jobs, where the only female characters to have speaking parts are women who either raised Steve Jobs, slept with him, married him, were fathered by him, or answered his phones. I guess you could argue that the tech world was dominated by men, particularly in the ’70s and ’80s, when much of the movie takes place. I guess you could also believe that the fonts and icons in the original Macintosh designed themselves. Sure, it’s not a person, but who’s to say research-and-development labs can’t have feelings, too? The two visits to the research facility by Apple employees—especially one in 1979 that included Steve Jobs—have taken on mythical proportions, with some myths more accurate than others. But it’s certainly clear that the visit had an impact on Jobs’s outlook about personal computing. It feels an odd oversight in Jobs for that moment to take place when the cameras weren’t rolling.